Over the last 6 years I have shot A LOT of weddings, as I'm sure you can imagine haha. So I feel this makes me uniquely qualified to pass on some wisdom and experience to all my amazing future couples. It's a simple notion, one that I harp on about all the time. But it's one of the most importrant things I tell my couples. And it can be summed up in 3 simple words. But before you click off thinking 'what's this crazy b*tch yapping on about now? ', let me explain why it's one of the most important pieces of advice you will ever hear/read ahead of your big day. It might seem a little bit naive, but your wedding day is simply that, YOUR wedding day! I know we all want to bend over backwards to please family members. But really, shouldn't it be the other way round? Shouldn't they want to please you, and encourage your perfect wedding? I want to encourage all of my lovely couples that planning a day perfect for the two of you is ok, something that fits both of your personalities and dreams. Your family will always love you, no matter what, they might not understand it, they might not agree, but family is family, they will love you no matter what. What do both of YOU want your wedding to be? Take a moment to chat to each other about your hopes, dreams (because lets face it girls, we’ve all been dreaming of this moment) and ideas for your wedding. Whether you both want it to be big and extravagant, or small and intimate. Or if you want it to be boho and indie or more rustic & country. Whatever the vibe, style, type of wedding you want, talk about it all. When you have done this, make a promise to one another to try your absolute hardest to keep everything exactly the way you want it, whether this matches with others thoughts and expectations or not. This day is all about you. 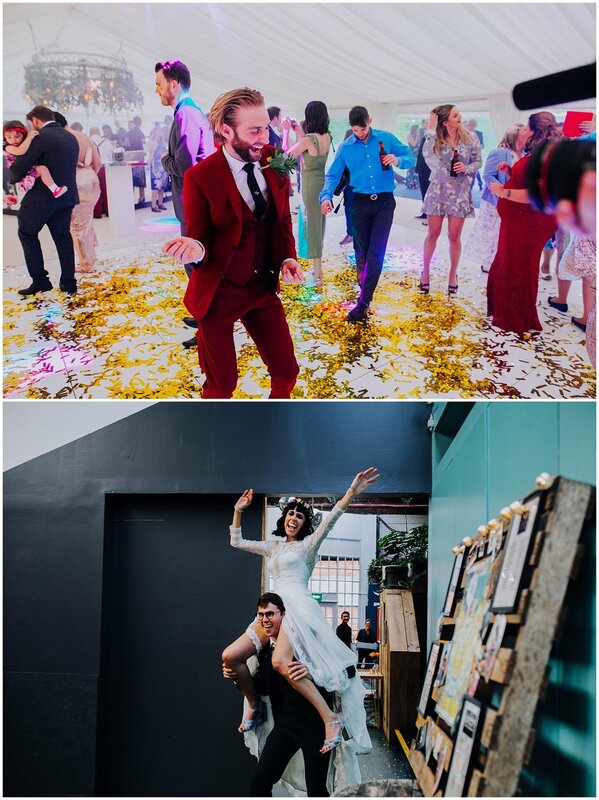 Whether it's getting married in a forest, or in a cool AF bar in town, then do it. GET YOUR FREAK ON! You will only regret it in the long run. I had one such couple this year, that started to plan a day which they really thought they wanted, something which would of pleased everybody, however, when they stopped and really thought about it, it turns out, it really wasn't what they wanted. Instead they opted for a destination wedding on Lake Bled in Slovenia. A place which was special to the both of them and had the potential to be everything they ever wanted. And girlllll let me tell you, it was all kinds of perfect! They wanted to pass on some words of advice and wisdom! This might seem easy for me to say, and if you suffer from anxiety, please do excuse me. But I know a lot of lovely brides and grooms who have let their worries and anxieties ruin what should be one of the best, most fun days of their lives. Being super organised ahead of the wedding is amazing, and always helps make sure everything runs without a hitch. However, there is such a thing as being too organised - like on your wedding day for example. A LOT of Brides and Grooms are so stressed and anxious that something will go wrong that they let their panic and worry overwhelm them. They might still have a good time, but it's not always as fun as it should be. There is always this underlying feeling of worry and stress which dampens what should be the one day you can relax. My advice is to trust in not only you amazing organisational skills ahead of the wedding (I don't even care if you went all Monica with a headset, at least sh*t got done). But also in the suppliers that you have chosen for your big day. We have all done this hundreds of times, we've seen it all, we've managed every situation there is to manage, we've worked through the worst weather recorded and we've defused some of the most tense family dynamics there is. Trust that we know what we are doing, and that we will all make sure you have the most amazing day ever. Besides, you've spent the last 2 years planning the perfect wedding, why not enjoy it the best you possibly can?! You know when you're a kid and your Mum slaps your hand when you're adjusting your skirt too much, or when your Mum tells you to 'stop doing that you look awkward' - No? Just me then! HAHA! When you aren't being yourself, I CAN TELL! Honestly I can. It's some kind of photographer 6th sense I've picked up over the years. Trust me, you will be able to tell in your photos. So don't be anything less that 100% you. This is the last and most important point I need to make! Do you want to look back in 6 months, a year, 10 years time, and think, why oh why did I do that? Hell no you don't. You want to fire up your computer/open and album/flick through your prints and think, how f*cking amazing was that day?! I never want any of my couples to regret a single decision they made. So don't be one of those couples that do. Follow all of the above advice and I promise you, you will have the most amazing wedding day ever, filled with love, laughter and some damn right incredible memories to boot. Heres some photos of my Brides and Grooms keeping it real and being themselves!